The sense of enmity on the waters of the Taiwan Strait has risen significantly following what the Taiwanese government called a “reckless and provocative” flight by two Chinese fighter jets into Taiwan’s airspace last Sunday. The Chinese People’s Liberation Army Air Force (PLAAF) Shenyang J-11 fighters crossed the median line in the Taiwan Strait, violating what Taiwan’s foreign ministry called a “long-held tacit agreement” in a tweet. Chinese aircraft conduct regular operations in the Strait and often approach Taiwanese airspace, but they rarely cross the median line separating China and Taiwan. Taiwan President Tsai Ing-wen responded by vowing a “forceful expulsion” of Chinese fighters should they cross the median line again. During a Thursday inspection tour of an air force base in Chiayi, Tsai instructed pilots to respond to future Chinese incursions with force and vowed to “fight alongside you all to the last” in defense of Taiwan’s sovereignty. On the morning of Sunday, March 31, Taiwan’s air force responded to the PLAAF jets by scrambling its own jets and airing warnings. The Chinese jets then retreated into their own airspace, according to Taiwan’s defense ministry. The Chinese incursion came days after Tsai, during a stopover in Hawaii, publicly asked the United States to approve a sale of F-16V fighters and M1 Abrams tanks to Taiwan. Reports indicate the United States is preparing to approve the sale of the fighters, which is opposed by China. Geng Shuang, a spokesperson for China’s foreign ministry, said in March that China had “made stern representations to the U.S.” over the potential sale. During her stopover in Hawaii, Tsai spoke via a video call to a group at the right-wing Heritage Foundation in Washington, D.C. which included U.S. Republican Senator Cory Gardner and Representative Ted Yoho, both ardent supporters of Taiwan. China has objected to visits by Tsai to the United States, which has not formally recognized Taiwan since 1979; periodic talk of Tsai making an official visit to Washington has not yet come to fruition. On March 24, the United States also sent Navy and Coast Guard ships through the Taiwan Strait, a move which drew a rebuke from China. The United States, which maintains that such passages constitute regular transit through international waterways, has sailed warships through the Strait three times in 2019 and six times in the past nine months. Prior to July 2018, its ships made the passage about once every year. The uptick in hostility between China and Taiwan, an unofficial yet critical U.S. ally, comes as the United States and China continue protracted negotiations to end their ongoing trade standoff. Some commentators have posited that Taiwan has become a key variable in resolving the trade war. Taiwan and the United States currently enjoy a relationship which Tsai, during her stopover in Taiwan, characterized as being “stronger than ever.” Taiwan’s government is preparing to celebrate the 40th anniversary of the Taiwan Relations Act, which was enacted on April 10, 1979 and has served as a foundation for unofficial yet robust ties between Taiwan and the United States, which switched its diplomatic recognition from Taipei to Beijing three months earlier. The United States will officially open the new American Institute in Taiwan (AIT) complex in Taipei on May 6. On Wednesday, it also stated publicly for the first time that military personnel have been stationed at its Taiwan offices since 2005. In the past, AIT had declined to comment on whether military staff were stationed at its complex, although the presence of plainclothes U.S. military forces at AIT had been the subject of constant media speculation. 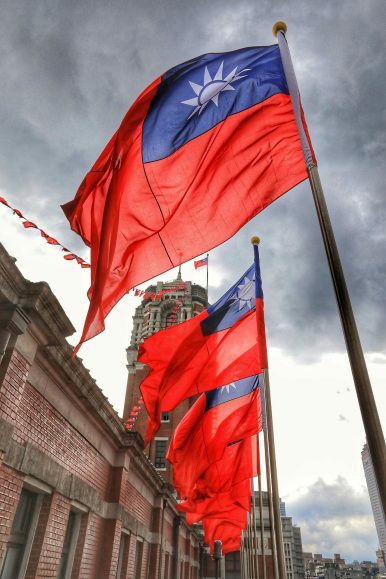 Relations between Taiwan and China, along with those between Taiwan and the United States, have come under scrutiny in the lead up to Taiwan’s upcoming 2020 presidential election. Tsai declared her intention to run for re-election in a February interview with CNN. However, she has since been challenged in the Democratic Progressive Party (DPP) primary by her former premier, William Lai, who has been critical of what he terms Tsai’s maintenance of the cross-strait status quo at the expense of a more confrontational stance towards Beijing and its desire to assert sovereignty over Taiwan, which many Taiwanese people fear would imperil the nation’s democracy. Meanwhile, prospective candidates in the opposition Kuomintang (KMT) have spoken favorably of establishing a cross-strait peace treaty with China. KMT Chairman Wu Den-yih, who is rumored to be mulling a run for president, first floated the idea in February. Former New Taipei mayor Eric Chu, who announced his intention to run in December, told Bloomberg in February of his belief in the essentiality of warmer cross-strait ties. Perhaps the KMT’s most notorious politician, Kaohsiung Mayor Han Kuo-yu, recently completed a trip to Hong Kong, Macau, and China during which he reaffirmed his belief in the “1992 consensus” – a supposed agreement between Taiwan and China under which both sides agree there is “one China,” but disagree on the interpretation of what “one China” means – and met Chinese Communist Party (CCP) officials to discuss trade deals between Kaohsiung and Chinese municipalities. The DPP does not recognize the “1992 consensus.” Chinese President Xi Jinping stated in January his position that the agreement allows for a “one country, two systems” framework of governance in Taiwan. Politicians in both major Taiwanese parties, including KMT notables such as Han, have rejected the “one country, two systems” model, although many KMT politicians have simultaneously affirmed their commitment to the 1992 consensus. Opinion polls in Taiwan show that the eventual KMT candidate is projected to defeat Tsai should she win her bid to seek re-election as the DPP nominee. However, Tsai’s cross-strait policies remain popular, and only about 18 percent of Taiwanese favor either immediate or eventual unification with China, according to polls conducted in December by the Election Study Center at Taipei’s National Chengchi University. A substantial U.S. arms sale to Taiwan could reaffirm the commitment of the United States to defend its unofficial ally. The DPP relies heavily on the support of the United States, although the KMT also wishes to forge closer ties with the United States and is exploring opening an office in Washington, D.C. While the United States and China both watch Taiwan’s domestic political developments with interest, Taiwanese presidential candidates will likewise look outward at relations between the two powers as they seek to present to voters a winning answer to the country’s eternal cross-strait question.